HOLLAND, Mich. (March 28, 2019) — Elzinga & Volkers, a leading West Michigan construction company, today announced the organization has been honored with their second Associated Builders and Contractors, Inc. National Safety Award. E&V received the Pinnacle Award at the 29th Annual Excellence in Construction Gala on Wednesday, March 27 in Long Beach, California. In 2018, the company was honored with National Excellence in Safety Award. The Pinnacle Award for safety is touted for recognizing the Best of the Best, an industry leader focused on providing an example for others to follow and taking an active role in providing training and guidance for other companies looking to better their program. 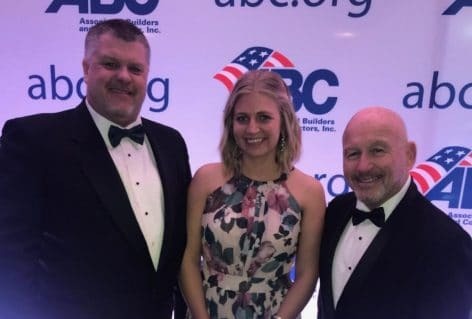 The ABC National Safety Excellence Awards recognize companies who exhibit a continued commitment to jobsite safety and whose safety performance and programs are judged to be exemplary by the ABC National Environment, Health & Safety Committee. Awards are based on data submitted through Safety Training Evaluation Process applications, essay questions and video interviews with company presidents, CEOs or principals about their corporate safety culture. Award categories are based on a company’s total work hours per calendar year and placement within the North American Industry Classification System. The organization will be holding their sixth annual Safety Week April 22- 25. During this week, E&V will host events to promote workplace safety. Over the past five years, E&V has trained a total of 1,101 people through free trainings in first aid, rigger, scaffolding, fall protection, silica standards and more. All trainings are free to trade contracting companies in an effort to spread safe working practices industry wide. To find more information about this year’s programming, visit elzinga-volkers.com/safety-week. Elzinga & Volkers Construction Professionals is a leading provider of construction management services, assisting clients nationwide since 1945. Locally owned and headquartered in Holland, Michigan, the company specializes in delivering the highest quality construction management and consulting services to a wide variety of industries including healthcare, senior living, manufacturing and food processing. Elzinga & Volkers has been acknowledged nationally as a leader in construction safety, named Michigan Contractor of the Year twice and recognized nationally as a “Best and Brightest Company to Work For” eleven years in a row. In 2018, Elzinga & Volkers performed work in over 20 U.S. states and has entered 2019 with its largest backlog in company history.